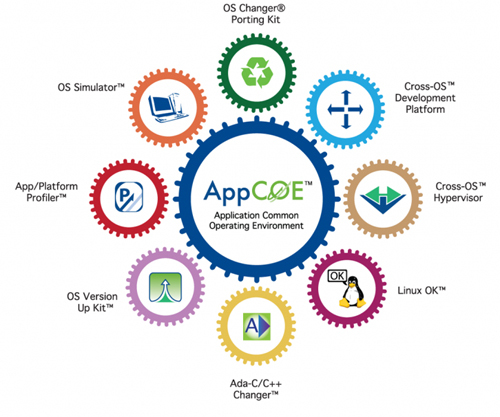 Application Common Operating Environment (AppCOE™) is a framework of common architecture that promotes interoperability and cross-platform capabilities among systems and devices. It is built on the powerful open source Eclipse-based framework and integrates all of MapuSoft’s tools: OS Changer®, Cross-OS Development Platform™, Cross-OS Hypervisor™, Linux OK™, OS Simulator™, App/Platform Profiler™, OS Version UpKit™ and Ada-C/C++ Changer™. Embedded C, C++ and Ada applications can be standardized on AppCOE to allow the applications to interoperate and run seamlessly on a single platform. 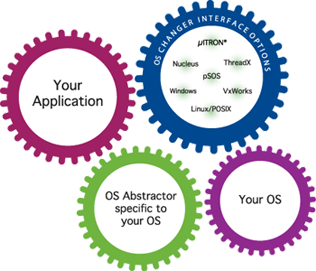 OS Changer® is a C/C++ source-level virtualization technology that allows you to easily re-use your software developed for VxWorks®, pSOS®, Linux/POSIX, Windows®, Nucleus®, ThreadX® and μITRON on another OS, while providing real-time performance. It eliminates the manual porting effort, saves money and shortens the time to market. The appropriate OS Changer Interface connects to your existing application that was developed on your current OS while the OS Abstractor® Target Specific Module (specific to your target OS) provides the connection to the OS you are moving to. MapuSoft’s OS Simulator™ allows engineers to develop and test embedded applications on Windows or Linux host environments. OS Simulator eliminates the need for the original OS, as well as the requirement for expensive target hardware during development. Without the need for those components, development and testing can begin much earlier. The result is lower licensing costs, reduced hardware requirements and a shorter time to market. OS Simulator also provides a virtualized test platform to simulate a system of applications interacting with each other on one or more CPU cores through simulated devices. Optionally, OS Simulator is available with source code to simulate embedded applications integrated with native tools/software on Windows or Linux target environments. Cross-OS Development Platform™ is a C/C++ source-level virtualization technology that provides a robust and industry standard OS interface architecture for flexible real-time application development, while allowing the user to protect the software from being locked to one OS. This negates future porting issues because the software will support multiple operating systems and versions from the beginning. It also eliminates the risk associated with the OS selection process, since the same application can be tested on multiple platforms for comparison and won’t be tied to the chosen OS. Ada to C conversion is made simple with Ada-C/C++ Changer™ can be used in two ways: as a converter or as a compiler. As a converter, it transitions Ada code to C/C++. When used as a compiler, Ada applications can support targets for which only C/C++ toolchains are available. Cross-OS Hypervisor is redefining virtualization from wrapper-based implementations to source-level virtualization, thereby bypassing multiple layers of OS and hypervisor schedulers to gain performance increases. 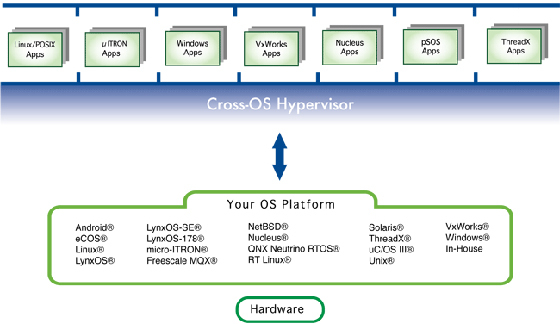 Cross-OS Hypervisor provides virtualization interfaces for POSIX/Linux, micro-ITRON, Windows®, VxWorks®, Nucleus®, ThreadX® and pSOS® applications. Developers are feeling additional pressure to get a performance increase from their embedded Linux due to increased real-time demands on applications, while having limited resources on their existing target hardware platform. To achieve additional performance, they will need to dig into the Linux operating system code to re-build the kernel and spend a considerable amount of time re-designing the application to improve performance. 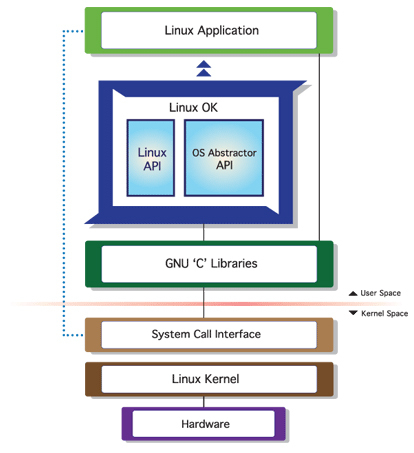 MapuSoft’s Linux OK™ (Linux Optimization Kit) framework provides several kernel and application specific optimization features all aimed at increasing CPU performance, speeding up boot-time and reducing memory footprint for Linux applications. The Linux Optimization Kit provides header files and template code to re-direct the application to use the Linux OK interfaces. It also generates optimized interface code, based on the level of individual API usage in the application, and according to GUI settings input by the user which captures resource requirements and target environment settings. Linux OK improves application performance by reducing run-time creation and deletion of OS resources by pooling and reusing them across applications/processes. Linux OK also reduces unnecessary task and user/kernel mode switching. 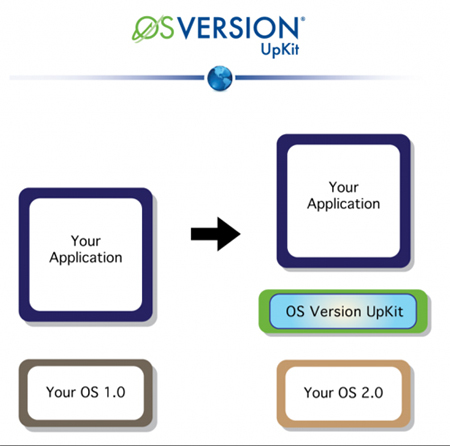 OS Version UpKit™ allows applications to easily upgrade operating system to newer version of the OS, without the manual porting effort.